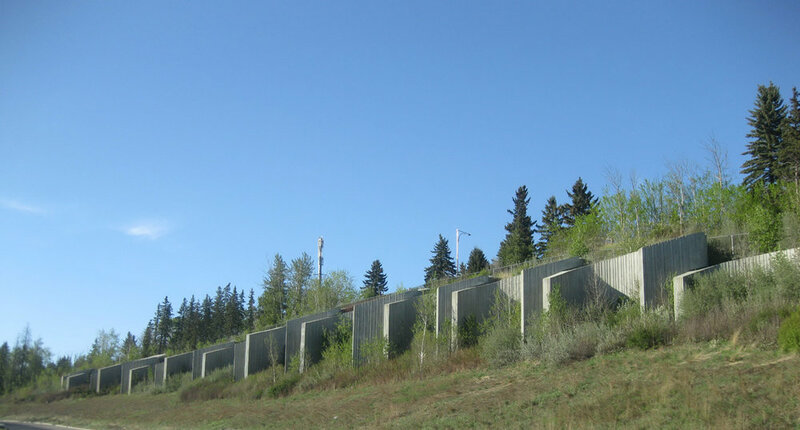 Quesnell Bridge Retaining Walls, Edmonton — HFKS Architects Inc.
Widening of this section of the Whitemud Drive included the replacement of the existing large two-tier steel bin retaining walls adjacent to the roadway to the north of the North Saskatchewan River. The design used a series of vertical arches, constructed from interlocking secant piles to form an exedra retaining wall (an exedra is the space formed in front of a vertical arch). Design is structurally efficient, using less concrete and steel reinforcement than other options. The structure is aesthetically more impressive and less imposing than a large flat faced wall.